Here at Shutter Tours we try to build relationships with the employees at the various locations we share with our customers. Today I made a couple of stops in the Skagit Valley in Mt. Vernon , Washington to see how the tulip fields were coming along in anticipation of our Tulip Festival Tour. 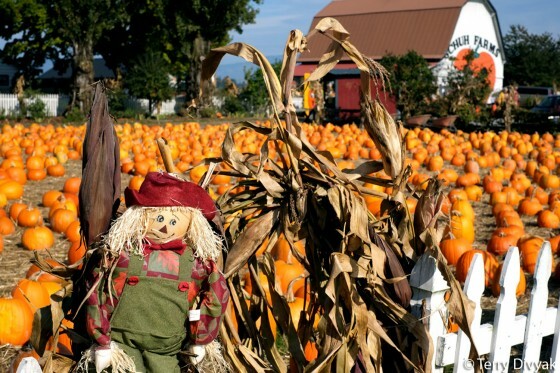 We have always wanted to stop by Schuh Farms and after doing so, we will be adding it to our tour next year. This is a wonderful stop with so many things to see and do. Of course I had my camera at the ready and spent well over an hour taking some fun photos as the pumpkins were out in anticipation of Halloween. 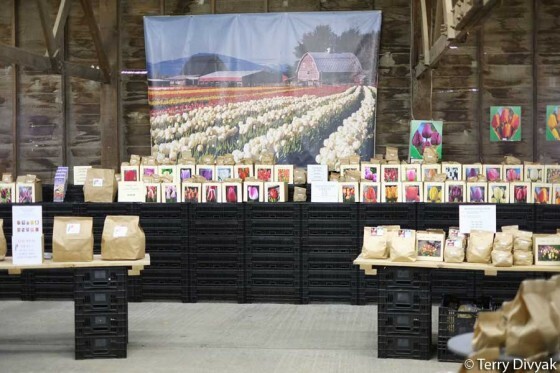 Steve Schuh spent some time sharing a little bit of information about the farm and was excited to share with me all the various fields that he owns and the great things his farm has to offer for our customers during the Tulip Festival. 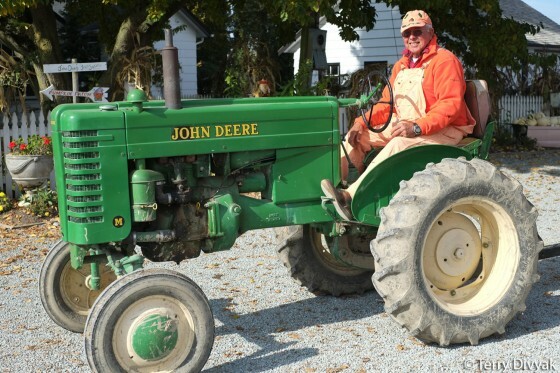 As he got on his tractor to give a school children a Hayride, I took a quick photo and was excited to see him again next year during the Tulip Festival. 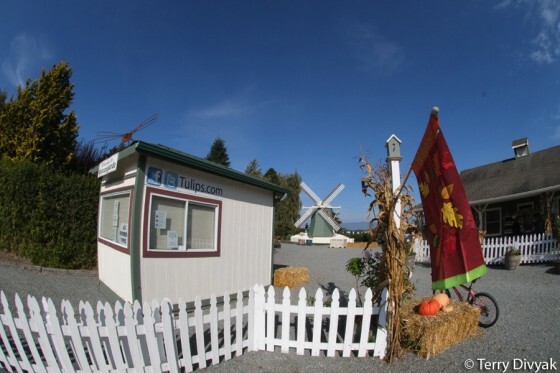 My next stop was Tulip Town, another location we stop at on the tour and as I passed the entrance I was surprised to see the sign said “Open”. They are currently selling tulips both at their online store and at the location and I walked in to a completely different place than I am used to. 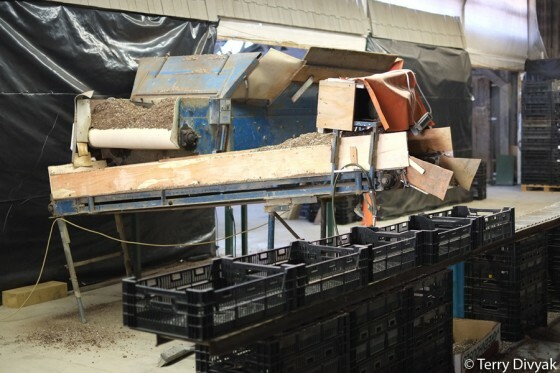 Gone was the gift shop where the art is sold and in its place were stacks of bins from planting the tulips. The lone employee Cathy, was filling bins with dirt and busy getting bulbs together for more planting . There was a large area set aside to purchase bulbs and I was struck by how this business does not just run in April, but all year round. A grabbed a few bags of bulbs and am excited to plant them and use them as an “Indicator” of where the progress of the fields may be before our tours. Next Stop I headed over to Roozengaarde to see how the gardens were coming along. Right away I ran into Marcia who was busy getting the store ready for the holidays and Ricardo the Head Gardener. He is the one with the help of his crew and staff, creates all the magic us travelers get to enjoy during the Tulip Festival. He always has a uplifting attitude and you know he really enjoys his work as his pride and joy of the gardens entertain 100’s of thousands of people. I can only imagine how many millions of photos are taken by all the visitors. 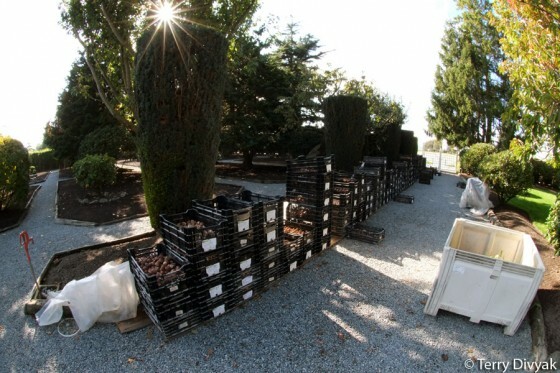 Ricardo told me they will plant about 250,000 bulbs this year. 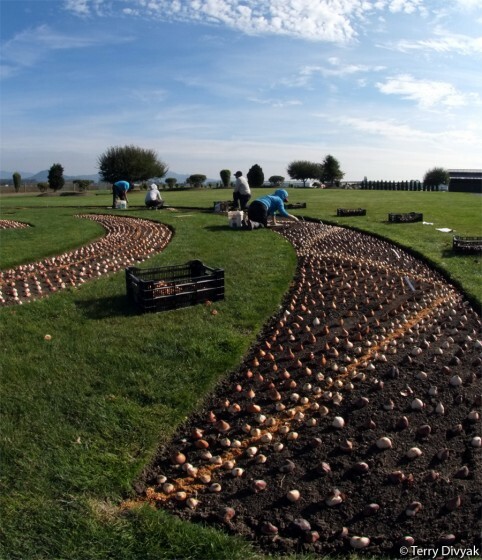 Each Tulip bulb is laid out and then one by one, planted by hand. This is painstaking work that takes about 4 weeks to complete. As I wandered around the garden, the were many bins lined up waiting to be planted. 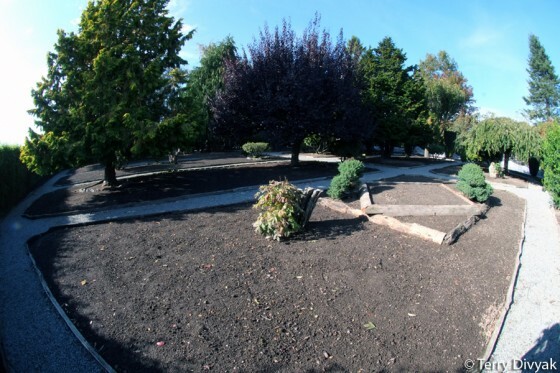 I have to admit it was a bit odd to see the gardens filled with dirt and no flowers. On this beautiful October day the sun was shining, birds were singing and the employees were all working with a smile on their face. It seemed as if they were all in tune with Mother Earth and happy to be contributing to something that brings so much joy to the people. 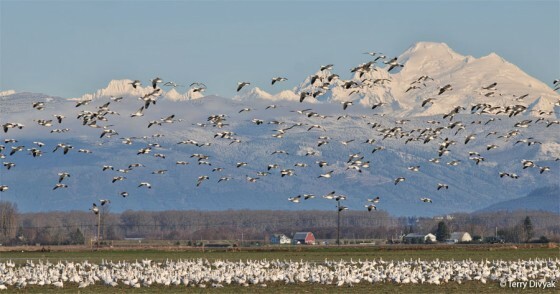 As I left the gardens and started driving through the Skagit Valley, I could see a large flock of migrating Snow Geese coming in from their summer breeding grounds from Siberia (Note: Photo taken during a previous Tulip Festival Tour) . The next six months they will call the Skagit Valley home. I smiled to myself, thinking I am so fortunate to live in such a beautiful part of the world as I drove past the newly planted tulip fields. Sharing it with people from all over the world is a great reward that I hope you can share with us in 2016. 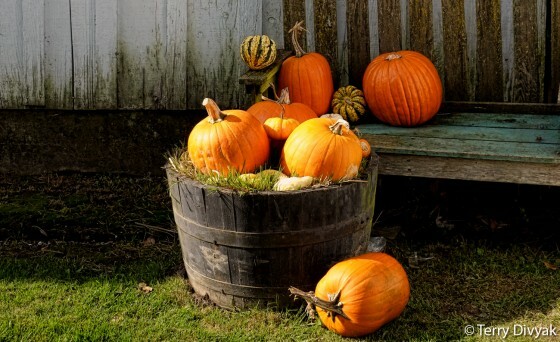 This entry was posted in Tours and tagged roozengaarde, skagit valley, tulip festival tours, Tulip Town. Bookmark the permalink.